Estelle Getty (center, sitting), who will forever be remembered as the sharp wit Sophia Petrillo in The Golden Girls died today at age 84 of natural causes. She suffered with dementia for the last several years of her life. Before The Golden Girls (for which she won an Emmy), she appeared alongside Harvey Fierstein on stage in Torch Song Trilogy. 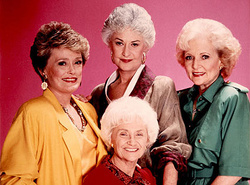 Following The Golden Girls she continued the role in 4 further series The Golden Palace (starring), Empty Nest (recurring), and Sisters and Blossom (guest appearances). In 1988, she published an autobiography, If I Knew Then, What I Know Now... So What? Her filmwork included Mannequin, Stuart Little, Mask, Tootsie, and Stop! Or My Mom Will Shoot.